After watching countless YouTube videos promoting Nature Box (Hello Shaytards and Shadesofkassie) I finally “caved” and got a trail subscription. I was going to get the cheaper trial box, but it didn’t make sense when there are so many 50% off your first box coupons! So I got my first box, with 6 different snacks to try. 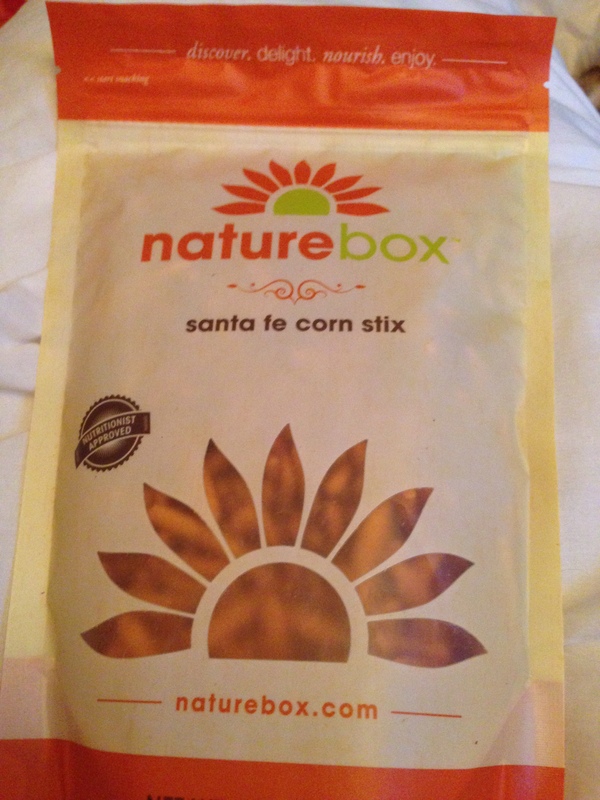 When you join NatureBox, you’ll receive five different snacks every month. You can choose the snacks you want or let us surprise you with our carefully curated selections. For one in six Americans, hunger is a reality. With Feeding America, we promise to donate at least 1 million meals this year. For every box we deliver, we’ll donate one meal. Let me tell you, I waited very impatiently for about a week for my box to arrive. I hate waiting, I’m from this generation that loves instant gratification. However, when the box finally arrived, all the waiting dissipated and the excitement sunk in. Ingredients: Honey, Oats, Natural Peanut Butter (roasted peanuts, sugar, palm oil, salt), Chopped Peanuts, Raisins, Oat Bran, Strawberries (strawberries, sucrose, citric acid, natural flavor, medium chain triglyceride oil), Flax, Canola Oil. These are wheat, dairy, and soy free. The granola clusters are peanut buttery, with dried strawberries in the mix. Ingredients: Raisins, Brown Rice Syrup, Sugar, Oats, Almonds, Coconut, Malted Wheat Flakes, Water, Canola Oil, Sesame Seeds, Apples, Soybean Lecithin Oil, Natural Flavors, Cinnamon, Vanilla Extract, Baking Soda, Salt, Malt Extract. This tastes like oatmeal cookies with apples in it. They’re delicious. Ingredients: Pumpkin Seeds, Cranberries (cranberries, evaporated cane juice, sunflower oil), Sunflower Seeds, Almonds, Papaya (papaya, evaporated cane juice), Raisins, Brazil Nuts, Apples. This is also dairy, soy, and wheat free. This is a delicious trail mix that I could sit and eat handfuls of. Ingredients: Oven Baked Almonds, Cane Sugar, Rice Syrup, Dried Cranberries, Crispy Rice, Brown Rice, White Rice, Palm Oil, Natural Flavor, Sea Salt, Guar Gum. 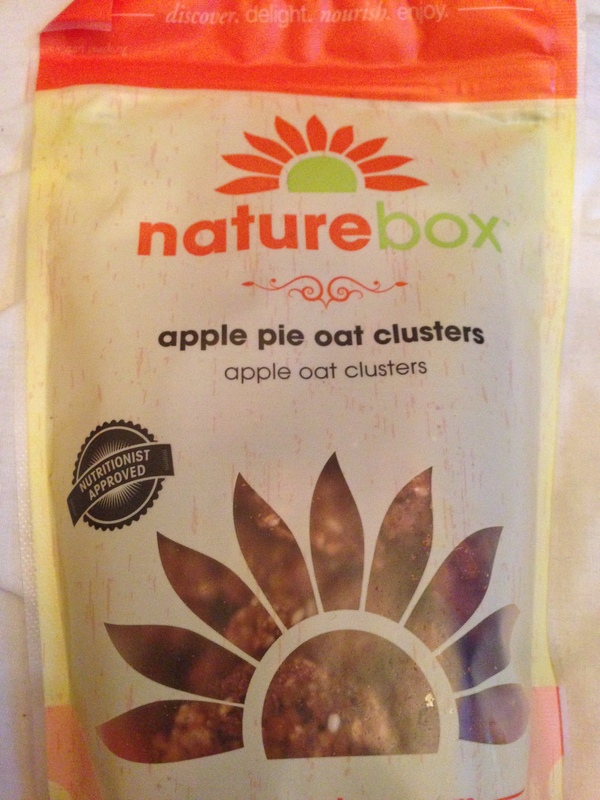 These are similar to the apple pie bites. They’re a little sweet and a little salty. Ingredients: Yellow Corn Masa, Soybean Oil, Salsa Seasoning (whey powder, tomato powder, salt, maltodextrin, green pepper powder, onion powder, natural flavoring, spices and herbs, torula yeast, beet powder [for color], annatto [for color]). These are delicious. They taste like nacho cheese doritos to me. They’re also wheat free, and nut free. Ingredients: Whole Grain Oats, Brown Sugar, Dried Cherries (cherries, sugar, sunflower oil), Almonds, Coconut, Pecans, Cocoa Powder, Maltodextrin [dietary fiber], Natural Flavors, Salt, Cinnamon, Mixed Tocopherols (vitamin E, soybean oil). This is dairy and nut free. This is a nice chocolately granola with dried cherries in the mix. I’m excited to mix this into my vanilla yogurt in the morning. 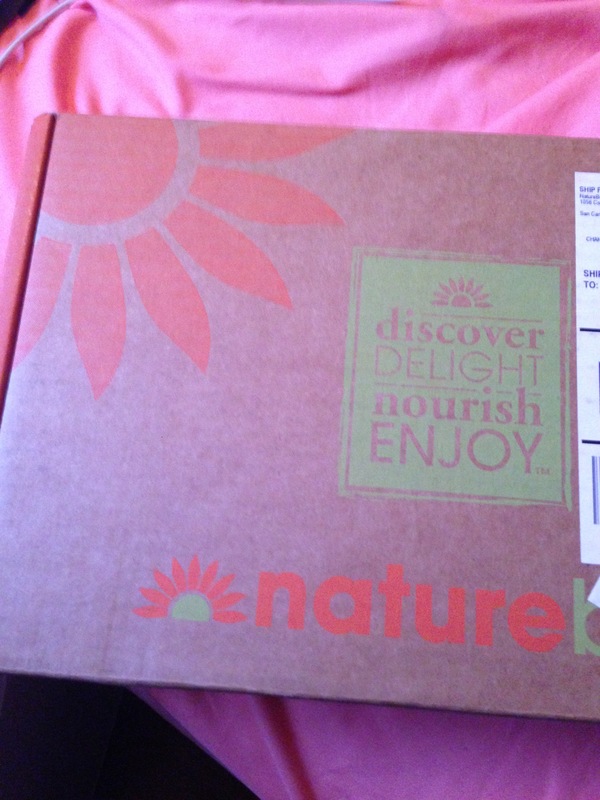 Each month you can either choose all 5 snacks you receive, or you can let Naturebox surprise you. Or, you can pick any number of the 5, and let them choose the rest. 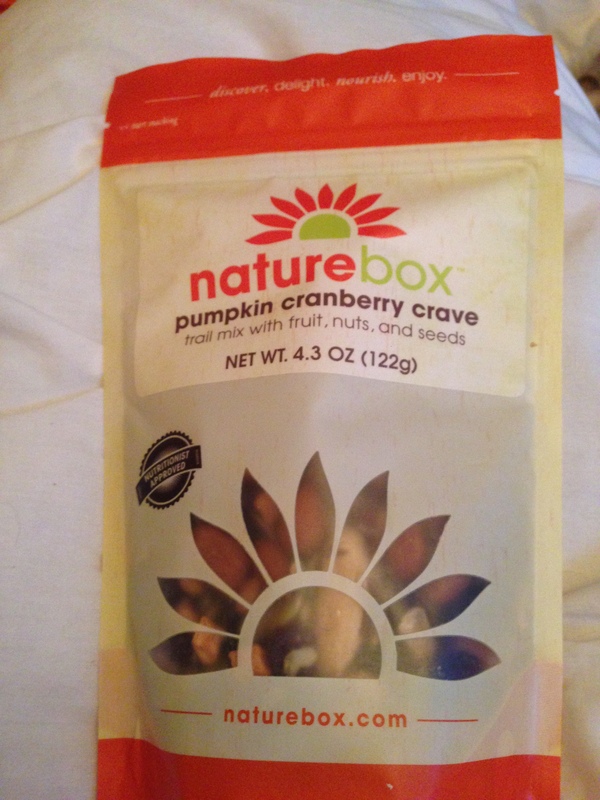 I picked the pumpkin cranberry granola, and then let them surprise me with my other 5 snacks. You can browse snacks or decide snacks by sweet, savory, spicy, or salty. You can browse by dairy free, wheat free, nut free snacks, so they’re great for any diet restrictions.